A Northumbria Police officer tests out the spray as Pc Mike 'Spike' Fisher rides by. A team has been tooled up with a DNA spray which will help them tag offenders and bring them to justice. The innovative substance which can mark criminals and link them to unsolved crimes is being trialled by Northumbria Police. The spray is being trialled by the force with problem motorcycle and moped riders the target of the campaign. Officers in Sunderland and South Tyneside are to carry canisters containing an invisible UV solution, with its first task to help in a crackdown on rogue riders using off-road motorbikes and mopeds illegally. 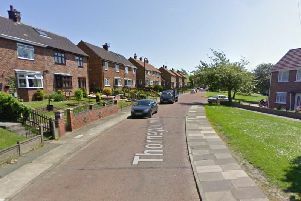 The initiative, supported by Sunderland City Council and South Tyneside Council, follows concerns raised by residents who can often feel intimidated and unsafe as a result of antisocial behaviour linked with off-road bikes. The water-based SelectaDNA tagging spray will mark equipment, clothing or skin with a uniquely-coded but invisible dye that can provide forensic evidence to link individuals or items to a specific crime. The spray will be utilised as officers are unable to pursue a suspect riding a motorbike or scooter for safety reasons, with the fluid put to the test before officers and council representatives earlier today with the help of Police Interceptor star Pc Mike 'Spike' Fisher, an officer with Cleveland and Durham Specialist Operations Unit, which patrols the roads. Temporary Superintendent Barrie Joisce, Pc Mike 'Spike' Fisher, South Tyneside Council Community Safety Partnership's Andy Bailey, Councillor Nancy Maxwell and Neighbourhood Sergeant Dave Stobbs. Temporary Superintendent Barrie Joisce believes the initiative will help protect the most vulnerable in society and bring regular offenders to justice. “This is something that has been successfully used at other forces across the country and will provide our officers with another effective tactic in combating antisocial, off-road biking,” he said. “It is unacceptable for the antisocial behaviour of a minority to bring misery to a majority who can be made to feel vulnerable in their own homes or intimidated when out spending time with their friends and family. “As part of this trial, we will also see whether the spray can be used to help detect other types of crime and bring those guilty of flouting our laws before the courts. The clear spray can be used to mark skin, property and clothing. “Our message to residents is clear; we hear your concerns, we understand your worries, and now we are actively looking to target those offenders who ride around on bikes committing crime and destroying the fabric of our communities. Officers will be given UV torches to detect individuals or bikes that have come into contact with the spray, and can then use forensic analysis to link offenders to a particular crime. The scheme will be trialled in Sunderland and South Tyneside but could be rolled out across the force if successful. The trial received funding from the councils, which are working alongside police to tackle an issue of concern to many residents. Sunderland's deputy leader and chairman of the Safer Sunderland Partnership, Councillor Michael Mordey, said: “The irresponsible use of off-road motorcycles in our countryside and our streets causes a serious nuisance which we need do something to discourage and prevent. “Working with our community safety partners we’ve put this practical solution in place which will help police officers to identify those responsible and their vehicles , so they can face future prosecution for their anti-social behaviour and illegal activities. Councillor Nancy Maxwell, lead member for Area Management and Community Safety and Chairman of the South Tyneside Community Safety Partnership, said: “These antisocial bikes are real concerns for communities. “They not only create a great deal of disturbance, affecting the quality of life for local residents, but they are often driven irresponsibly and at such high speeds, there is a danger that someone will get seriously hurt. “We are pleased to support the police in funding the trial of this new product, which is already proving effective in other parts of the country in helping to link offenders to specific crimes. Anyone with any concerns regarding off-road motorbikes or anti-social behaviour are asked to contact police on 101 or speak to an officer on patrol.